Regally, Harry Carney played baritone saxophone and other reeds in the Duke Ellington Orchestra from his adolescence to his death, a record of loyalty I think unmatched, even by Freddie Green with Basie. But even he could be wooed into other people’s record sessions now and again. An early and glorious appearance is on this 1936 Teddy Wilson date, where he sounds positively limber on WHY DO I LIE TO MYSELF ABOUT YOU? 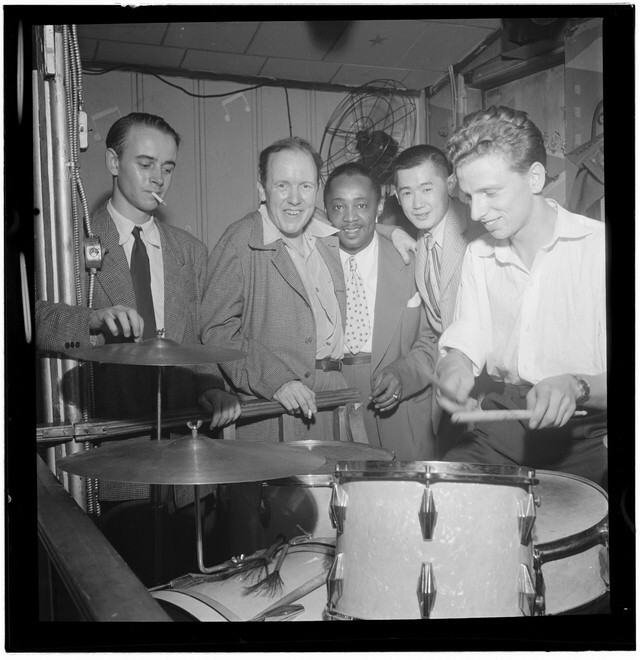 On this side, Billie Holiday sat out, or went home, but the instrumental performance of June 30, 1036, is priceless: Jonah Jones, Johnny Hodges, Harry Carney, Teddy Wilson, Lawrence Lucie, John Kirby, Cozy Cole. The date is from May 5, 1944. An anecdote I cannot verify is that Hall wanted Tricky Sam Nanton to play trombone but that Nanton’s loyalty to Ellington so strong that he would not. This record is an astonishing combination of timbres nonetheless, with Alvin “Junior” Raglin aboard as well. And Sidney Catlett, for whom no praise is too much. Finally (although I could offer many other examples) one of Harry Lim’s wonderful ideas for Keynote Records — he also created a trumpet choir of Roy Eldridge, Emmett Berry, and Joe Thomas; a trombone one of Benny Morton, Vic Dickenson, Claude Jones, and Bill Harris — this extravaganza of sounds with Carney, Coleman Hawkins, Don Byas, Tab Smith, Johnny Guarnieri, Al Lucas, Sidney Catlett, recorded on May 24, 1944. Whether it was the tempo or the imposing members of the sax ensemble, Carney seems ever so slightly to lumber, like a massive bear trying to break into a lope, but his huge sound carries the day. Tab Smith arranged for the date, and on this side he gives himself ample space: he sounds so much like our Michael Hashim here! Wouldn’t it be so rewarding in whatever our line of work might be to be so reliable and sought-after as Harry Carney was to Ellington and everyone else? I’m thrilled that I could visit Dan Morgenstern again at his apartment and we could talk and create something permanent that people could enjoy and learn from. The first session took place on March 3, 2017, and the results are here. About six weeks later, we got together again so that Dan, an enchanting storyteller whose stories have the virtue of being true, could share his love for his and our heroes. There’s much more to come. Now, this isn’t a post mooning about records made seventy years ago. I offer two performances created and captured on November 27, 2015, by a band of eminences . . . but the performances so reminded me of the Keynote label that it became a useful jumping-off point. For one thing, the hot numbers that Lim supervised built up to an almost unbearable tension: after one of those sides, I feel depleted, exhausted, as if the whole band had been jamming in my apartment. And when the session called for something slower — whether plaintive or a “rhythm ballad,” the time stretched out, as if the players had all the time in the world to tell their stories. Consider these performances by Ray Skjelbred and his Cubs, plus Marc Caparone on cornet. That’s Ray on piano; Kim Cusack, clarinet; Clint Baker, string bass; Katie Cavera, guitar; Jeff Hamilton, drums. The first song, ROCK AND RYE, a product of Earl Hines’ 1934 band, is indeed rocking: it refers to a combination of rye whiskey and rock candy / rock sugar. And since it pains me when people are reaching for information and not finding any of it there, here is a recipe for it. Not entirely tangentially, in a Whitney Balliett profile of Helen Humes, when she was appearing at The Cookery in New York, we hear Barney Josephson telling Helen that she has to drink some, that he had bought a whole case for her. But enough stories. Music, please! Blessings on the Cubs and on Ray and Marc, and on Paul Daspit, whose dear guidance makes such things happen. Oh, and there are more videos from this session. See you at this year’s San Diego Jazz Fest (November 23-27, 2016). The trumpeter Joe Thomas would have celebrated his birthday yesterday, but since he left us in 1984, I will do it in another fashion here. Throughout his career, Thomas was surrounded by more assertive, even aggressive trumpeters, who could play louder, faster, higher. And thus he did not always get the attention he deserved for his lyrical balanced style, which shone. But he is a great poet of shadings, tone, and beautifully placed phrases. At first, his playing might seem simple: ascending arpeggios that woo the ear. But his singing tone, the darks and lights of his sound, are permanently memorable. I saw him a few times in the early Seventies, and solos I heard still ring in my memory. That, to me, is the highest art. The other players on this brief poetic interlude — a swinging one! — are Tyree Glenn, trombone; Hilton Jefferson, alto saxophone; Jerry Jerome, tenor saxophone; Bernie Leighton, piano; Hy White, guitar; Billy Taylor, Sr., string bass; Lee Abrams, drums. Joe Thomas, a true poet of the idiom. His work never fades. I wrote at greater length about his quiet majesty here in 2009. Happily, much more of his work is available on CD and on YouTube, so he can be heard and loved in this century.